The pain never goes away. Immortality comes with a price, and the full sum must be paid in tears and blood - your own blood, not the blood of victims. This is a horror which cannot be escaped, but can be forgotten, if only briefly. Only in the places of dance and pounding music, where the scent of blood reddens the air, can solace be found. That is why the Kindred gather at the Succubus. That is why they are drawn back. That is why they die there. 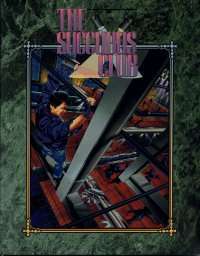 The Succubus club is a Sourcebook detailing the most notorious nightspots in the Chicago Rack. This book includes not only a complete description of this infamous club, but six complete one-chapter stories, each of them set within its confines. Cainites know of it as a huge and extravagant dance club where mortal vessels are easliy obtained, friends and enemies meet and intrigues and plots are hatched. only a few know of what ancient secrets it contains. The Succubus may well become the central meeting spot for your characters, for so many stories start and end there. It is the nexus of this dark city. It is the place of dreams, the place of nightmares.